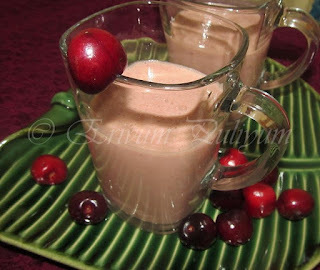 Here is one more recipe which I learned from my mother recently. 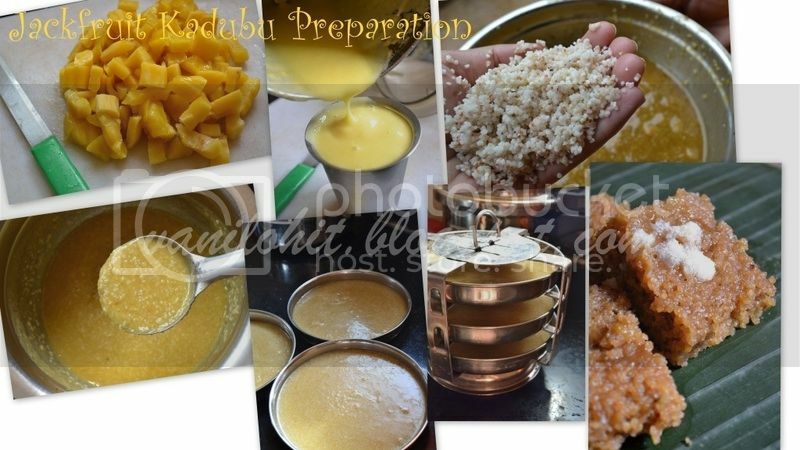 In fact its an old recipe, but never I had got a chance to prepare it :) Kadlemaddi is bit similar to the filling which we prepare for Obbattu. This traditional sweet is also called as 'Hayagreeva'. 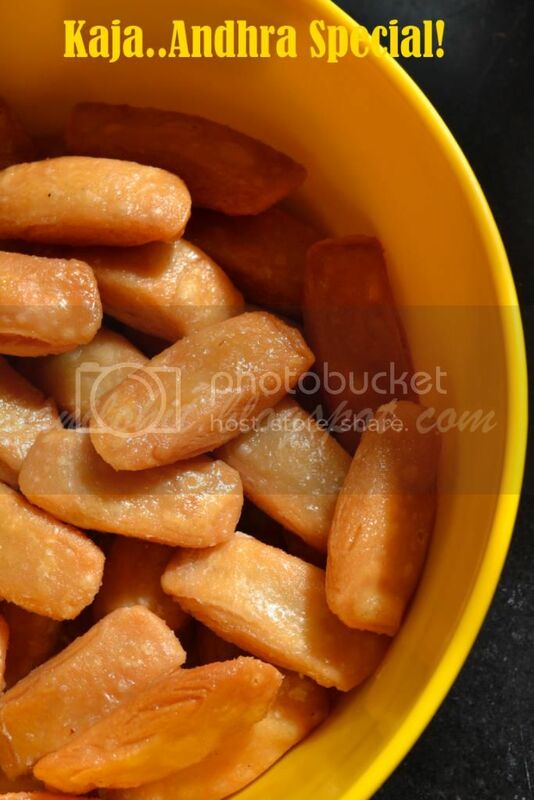 Below is the recipe of this simple sweet which is liked by most of the sweet lovers! Soak chana dal for about 30 minutes and pressure cook with enough water till very soft. It will get cooked nicely within 1 - 2 whistles. Drain off all the excess water and mash the cooked mixture lightly using a ladle or a masher. 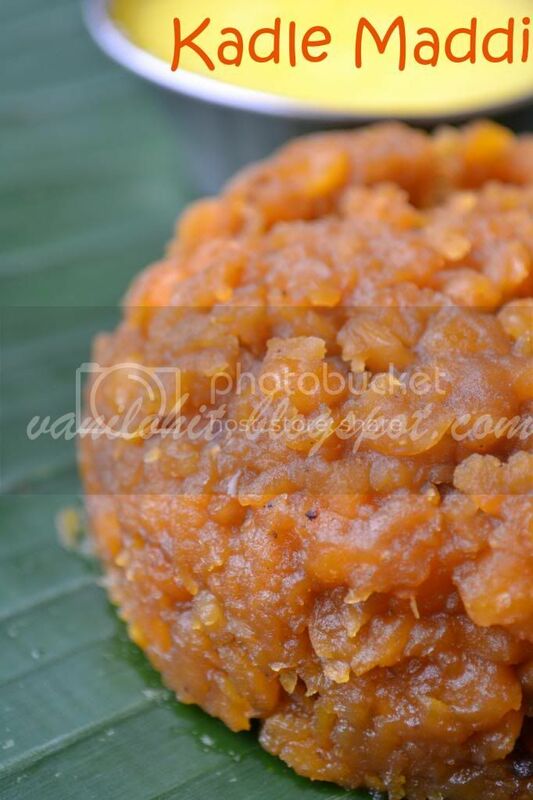 Take a heavy bottom pan and combine the mashed dal, jaggery, sugar, salt and grated coconut. Keep mixing it on medium flame till most of the liquid content is evaporated. Once the mixture becomes thick and won't stick to the ladle any more, add cashew pieces, raisins, powdered cloves and cardamom and switch off the flame. Finally, add 2 tsp of ghee to the Kadle Maddi, mix it well and close the lid. Allow to get set for 10 minutes before serving. Serve it warm with a spoonful of ghee on the top. It tastes nice even without ghee. 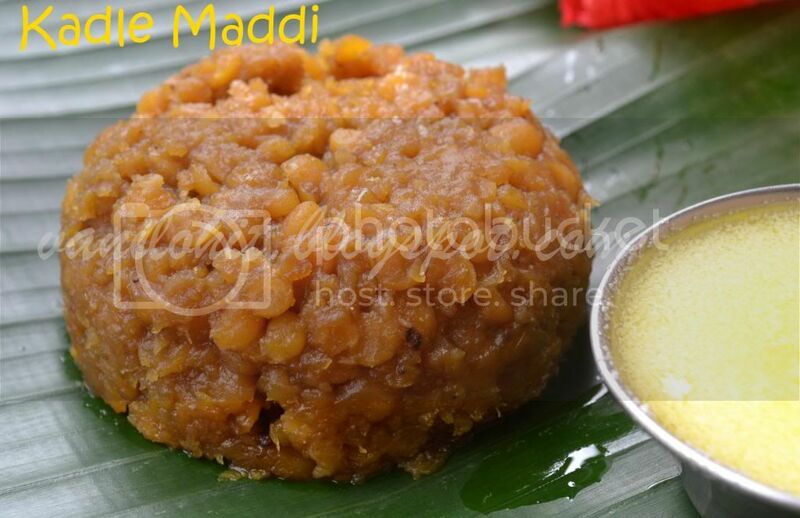 Kadle Maddi can be prepared using sugar also. Adding of jaggery is not a compulsion here. But adding of jaggery will definitely make a difference in taste. From past couple of months, I am not able to update my blog regularly. That's why, some of the recipe picks I clicked long back are still pending with me. Today I was just glancing at them and got inspired to write this recipe! 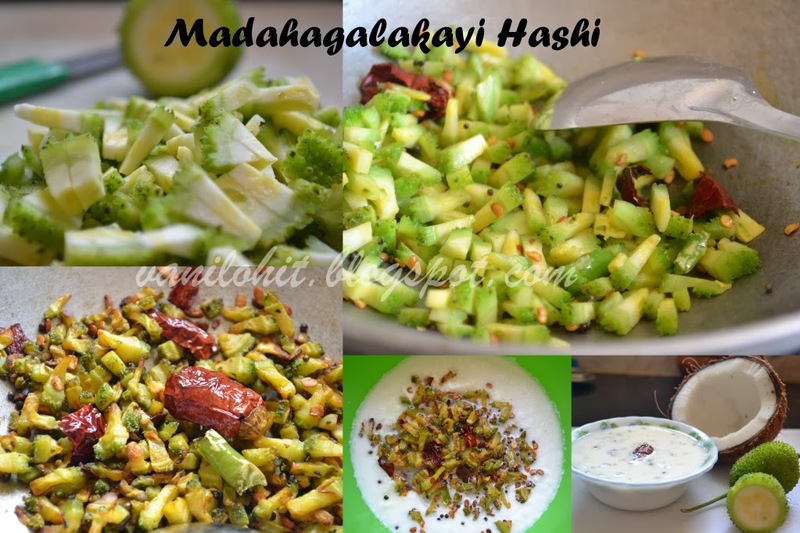 Marige Gojju is one of the traditional recipes of Havyakas. The name Marige Gojju is because of a special kind of vessel called as 'Marige' which was used to prepare this recipe. Marige means a wooden vessel which was used to mash and powder the ingredients for this Gojju. These days, nobody is using this kind of vessel in their kitchens. But we can see this 'Marige' in some houses of Malnad. 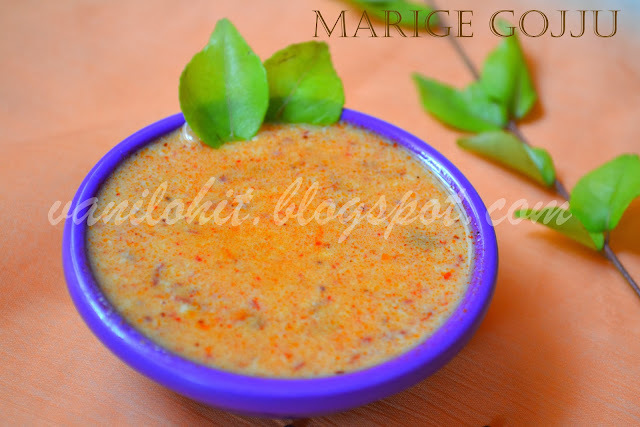 Here is the recipe of Marige Gojju which I learnt from mom. Try and taste this Gojju for your lunch or dinner..
Heat oil in a heavy bottom pan. Add dry red chillies, urad dal, mustard seeds, asafoetida and sesame seeds and roast them nicely. Add salt to taste before switching off the flame and allow the mixture to become cool. Now, mash and powder the whole mixture with the help of a ladle. Make the powder as fine as possible. Small grinding stone may ease your work. Add curd to this mixture and mix it well. That's all, tasty Marige Gojju is ready to serve! If you love the flavor of garlic, try adding crushed garlic to this recipe sometime. Mixie is not recommendable for powdering the ingredients here. Because, mashing the ingredients will enhance the taste of this Gojju. Bread fruit, which in Kannada is generally known as Beru halasu or Deevi halasu. 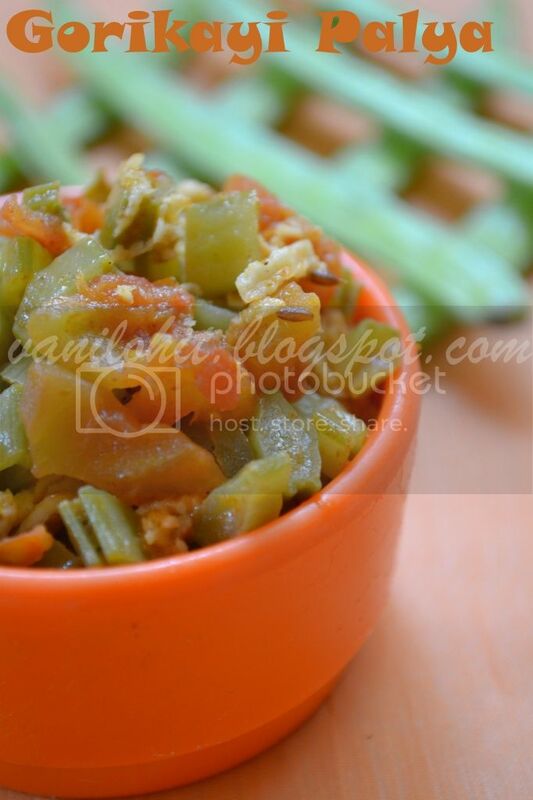 It is one of the commonly used vegetables in Malnad areas. Sambar (Curry) prepared from this veggie tastes delicious. 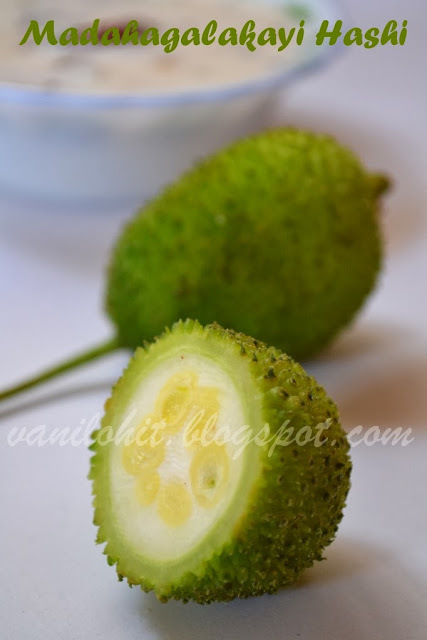 We can also prepare tasty chips, paapads, bhajjis and podis using Bread fruit. I have tasted varieties of Bread fruit dishes since childhood, but Chakke Paladya using this veggie was new to me. My mom prepared this particular curry sometime back and I liked it a lot. 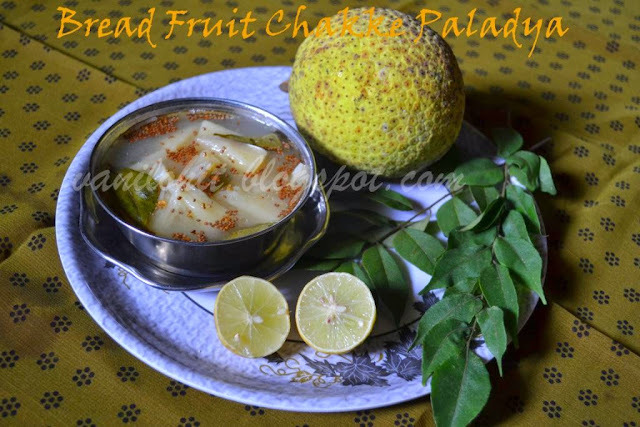 So, here is the recipe of Bread Fruit Chakke Paladya for you..
Seasoning: 1 tsp oil, 3/4 tsp mustard seeds, pinch of asafoetida, 1 strand of curry leaves. Peel off the skin and core part of the bread fruit. Make medium sized pieces. Take a pan and add water, salt, lemon juice, slit green chillies. Once the water starts getting hot, add the bread fruit pieces and cook till soft. Take out one cup of cooked pieces and allow to cool. Make a fine paste of the same once its completely cool. Add the prepared paste to the cooked mixture and bring to boil. Switch off the flame after 5 minutes. Heat oil for seasoning and add mustard seeds, asafoetida and curry leaves. Put it into the Chakke Paladya mixture. Enjoy this tasty curry with hot rice! 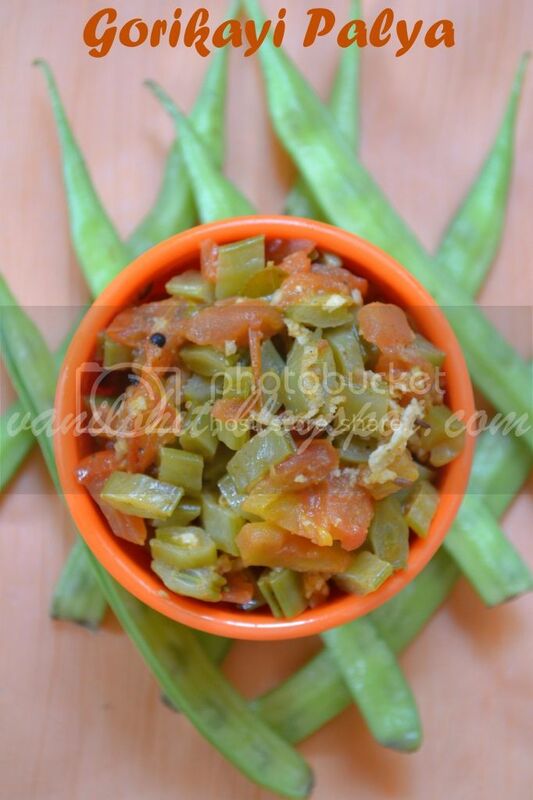 Cluster beans (gorikaayi / chavalikaayi ) is one of the all season vegetables available in Bengaluru. It's rich in proteins and fiber. It's seeds are dried and powdered and used in preparations of ice-creams,sauce etc..
To be honest, cluster bean is less used in my kitchen! My sister prepares it's curry whenever she buys. This curry is a good combination for rice, roti and chapati.Also it's easy to prepare. Here is the recipe learnt from my sister. Tomato - 1 medium size. 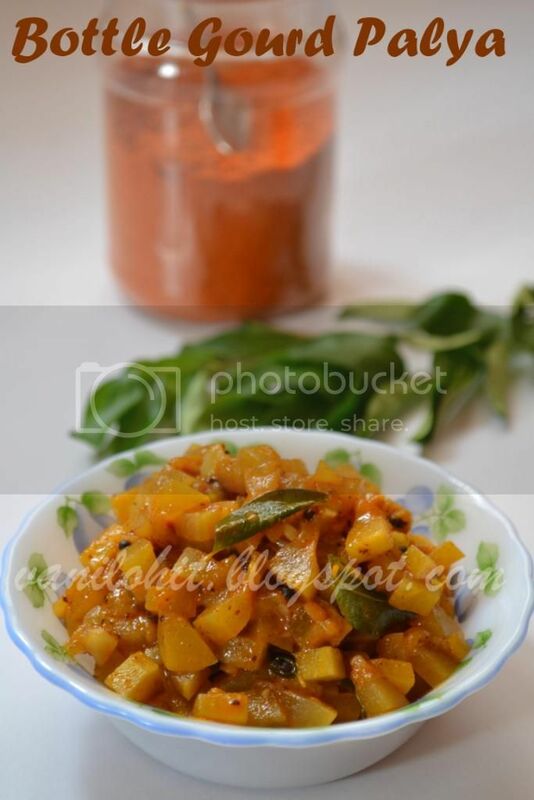 Sambar powder - 3/4 tsp or according to taste. Shredded coconut (optional) - 1/2 cup. Finely chopped coriander - 2-3 tsp. Sugar / Jaggerry - 1/4 tsp. Water - 1 1/2 cups. For seasoning: 2-3 tsp oil, 1tsp urad dal, 1tsp mustard seeds, 1/2tsp jeera, pinch of turmeric powder and a strand of curry leaves. Chop cluster beans and tomato into small OR medium pieces. Heat a fry pan and add the seasoning ingredients one by one. 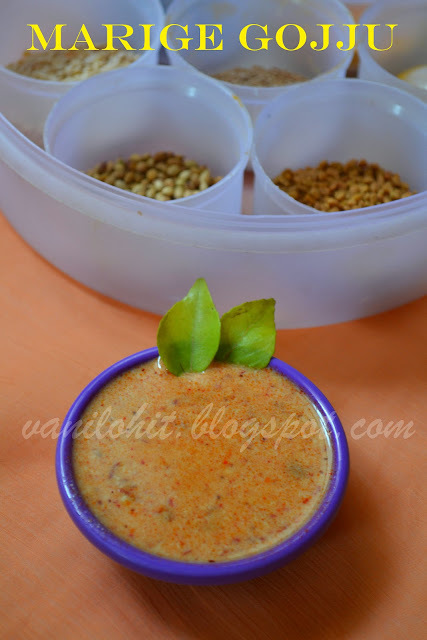 When mustard seeds splutter, add sambar powder and stir well. Now add tomato and coriander leaves and stir for 2 minutes. Add chopped cluster beans, 1 1/2 cups of water and mix well. Let it cook for 10-15 minutes covered in medium flame. Stir twice in between. When beans are cooked, add salt and cook for 5 more minutes. Now you can add fresh coconut and cook for 2 minutes. 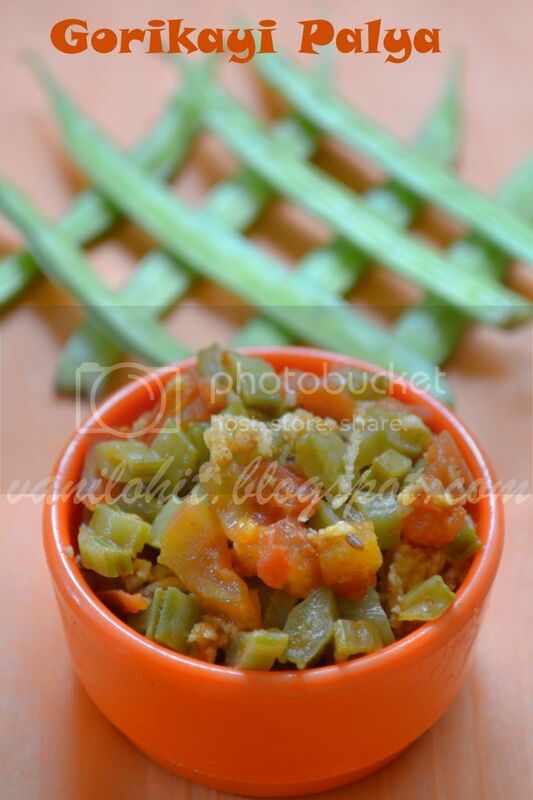 Tasty cluster beans curry is ready to serve! Sometime back, I had prepared Jack fruit Kadubu in our home. I actually wanted to post the recipe here and clicked some picks too..but couldn't take a picture of the final product that day! Last week, when my mom was preparing Kadubu, I told her the same and she insisted me to continue the recipe by taking some photos here. I did the same thing and now, able to post the recipe finally! Its the common procedure adopted these days is to prepare the Kadubu using Idli moulds. Traditional way is to cook it using plantain leaf covers. Kadubu cooked in plantain leaf wraps will be tastier than Idli kind of Kadubu. One more thing I wanted to tell with all my blogger friends.. I am not able to visit any of yours blogs these days. The reason is that I have got shifted to my mom's place now. Usage of internet is very limited and even I am not able to check my mails regularly. This may continue for few more months till I am back to my routine life. But whenever time permits, I will keep posting new recipes. 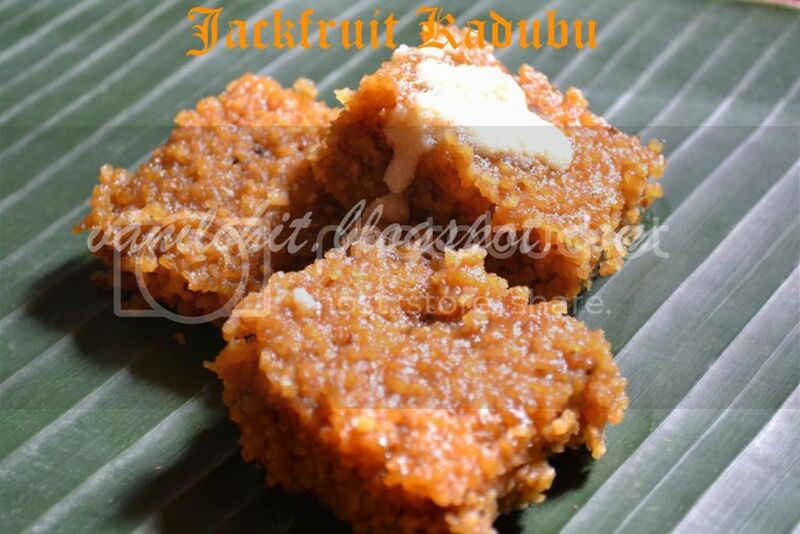 Here is the recipe of Jack fruit Kadubu for you.. Combine jack fruit pulp, jaggery, sugar and salt in a mixing bowl. Once the jaggery is diluted fully, add Akki Kadi and mix it nicely. Finally add cooking oil and cardamom powder and mix well. Kadubu batter should be little watery than dosa batter. If the batter looks too thick, you can add some water to dilute it. You can cook it like either as Idli or as Kadubu. If you want to cook them as Idli, pour the batter in idli moulds and cook it like idli. It takes at-least 30 minutes to cook them in idli cooker. If you are cooking them like Kadubu, it takes a minimum of an hour to cook. Cook the Idli / Kadubu till it is done nicely. Pour a spoonful of ghee on hot Kadubu and taste it! Kadubu once prepared will last for 2 - 3 days. 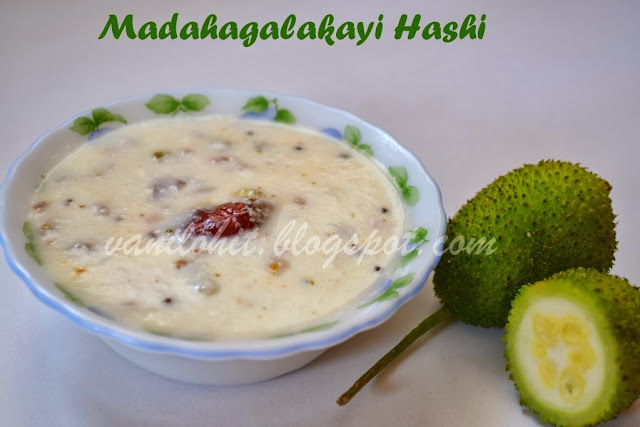 Here is one more way to enhance the taste of Kadubu..mash the Kadubu using your hands after its completely cool. To this, add 4 - 5 tsp of fresh ghee, 1 - 2 tsp of sugar and few strands of saffron (purely optional). Heat it on low flame in a heavy bottom pan for around 5 minutes. Serve it hot! Akki Kadi means, coarsely powdered rice. It looks like Idli rava. This can be substituted with Idli Rava also. If using Idli rava, add around 1 to 1 1/4 cup of Idli rava for 1 1/2 cup of jackfruit pulp. Also, its better to roast the Idli rava slightly before mixing with pulp. Adding the oil to the batter makes the Kadubu light. Also, it helps for easy digestion of Kadubu. 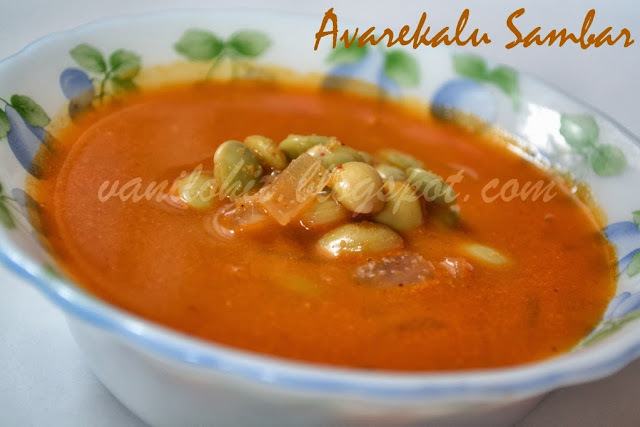 Here is the recipe of Avarekalu Sambar for you. It goes well with rice, roti as well as chapathi. Cut the onion into 2 halves. Chop one halve into big pieces and chop the other halve finely. Heat 1 tsp oil in a heavy bottom pan. Add cinnamon piece, red chillies, coriander seeds, cumin seeds and poppy seeds and roast them nicely. Switch off the flame and allow them to cool. Roast the onion (big pieces) and garlic in 1 tsp oil for 3 - 4 minutes and switch off the flame. Grind all the roasted ingredients along with grated coconut, 1/4th cup of cooked avarekalu and raw tamarind into fine paste. Heat 3 tsp of oil in a heavy bottom pan. Add finely chopped onion and roast it for a minute. Then add Avarekalu (Hyacinth Beans) and roast them for 3 - 4 minutes. Add the ground paste to the avarekalu mixture and saute them for 2 minutes or till the raw smell is gone. To this, add 2 to 2 1/2 cup of water, according to the consistency you need. Add salt and jaggery for taste and boil it for 10 minutes. Enjoy this delicious curry along with rice, roti or chapathi! Last month, we had a great family get together here in Bangalore. My cousin was the host this time and I wanted to prepare some special sweet for all of them. 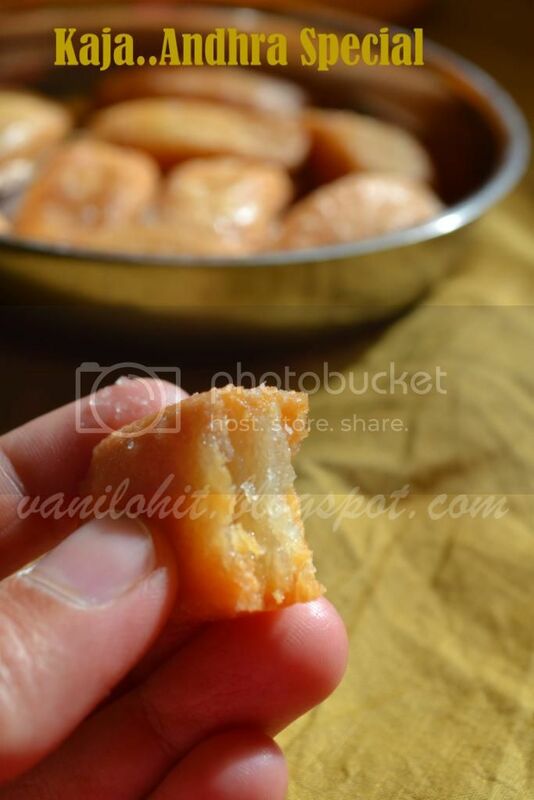 Long back, one of my Andhra friends told me about 'Kaja', a famous sweet from her region. Just checked with my hubby and finalized on this sweet for the occasion! There are 2 - 3 different varieties of Kaja which are famous in Andhra. I went with Kakinada Kaja this time which tastes bit similar to 'Saate' which we prepare in Karnataka. Kaja can be served as sweet as well as snacks! Water to prepare the dough - 150 ml approx. Mix all purpose flour and ghee in a mixing bowl. To this, add pinch of salt and sufficient water to prepare the dough. Prepare a non sticky dough ball from the mixture. Dough should be slightly harder than regular roti / chapathi dough. Let it rest for at-least 1 hour before preparing Kaja. In the meanwhile, mix sugar with little water and bring to boil. Once it reaches one string consistency, switch off the flame. Add the cardamom powder and close it with a lid. Now, make a big ball from the dough and roll it into a big rectangle on a clean surface using a rolling pin. You can use generous amount for dry flour for dusting. Roll it as thin as roti / chapathi and cut the edges. Roll the chapathi tightly like a stick (as shown in the pick) and cut it into pieces of 1 1/2 cm each. Flatten the cut pieces slightly using the rolling pin. Bring the oil to medium heat on a heavy bottom pan. Deep fry the flattened pieces on low flame in batches. For me, it took around 15 minutes to deep fry each batch of Kaja. 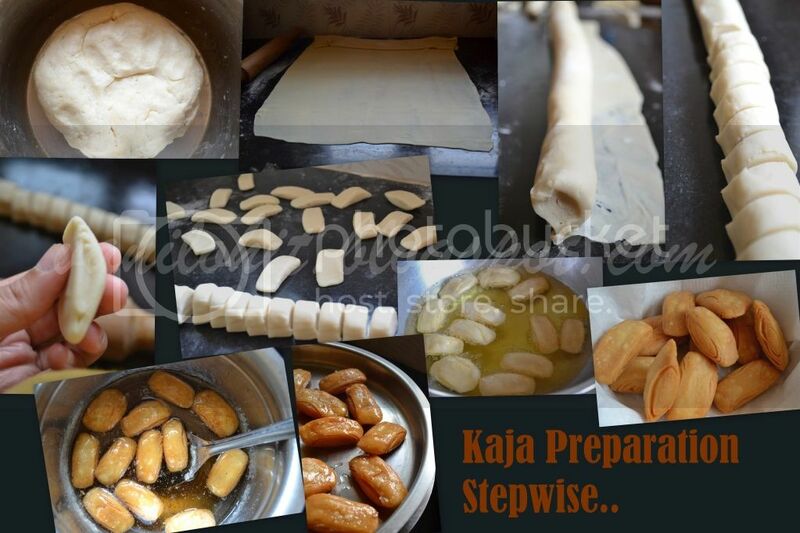 Transfer the deep fried Kaja onto a tissue paper to absorb excess oil. Then, soak them in sugar syrup for 5 minutes. Allow them to get dried after taking out from sugar syrup for 5 - 10 minutes. Delicious Kaja is ready to serve now! Store them in an airtight container and can use up to a week. Normally, December and January are the months when we get Avarekaalu (Hyacinth Beans) in Bangalore. But this year, Avarekayi is already there in the market in the month of July itself! My sister had brought some Avarekaalu from a shop near to her house last week. She had shared it with us also. We both are the fans of Avarekaalu Rotti. 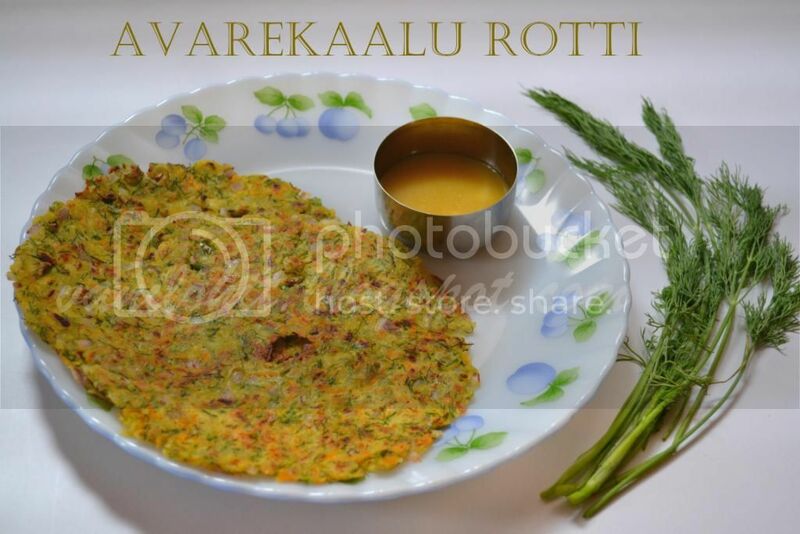 Just prepared delicious rotti using avarekaalu and enjoyed it! Still I have some avarekaalu in my freezer. So, let me try some other varieties using avarekaalu and share with you soon! Rice flour - 1 3/4 cup approx. Cook avarekaalu till soft. I have cooked it upto 3 whistles in pressure cooker. Drain all the water and keep the beans aside. Grate the carrots and crush the green chillies. Chop dill / fenugreek leaves and onion finely. Combine grated carrot, crushed green chillies, grated coconut and chopped veggies in a mixing bowl. Add salt to taste and mix ii well. Let it rest for at-least 10 minutes so that the veggies will leave their water content. Mash the cooked beans (avarekaalu) slightly and add it to the veggie mixture. Add rice flour little by little and prepare the dough. Dough should be in the consistency of regular chapathi dough. If the dough looks too dry, you can use 1 - 2 tsp of water while mixing. Make big lemon size balls from the dough and pat them on a greased plantain leaf or a plastic sheet. Make a hole in the middle of the rotti. Cook it on both the sides on a hot tawa. Add 1 - 2 tsp oil while cooking the rotti. Cook the rotti on medium or slightly low flame to make them crispier. 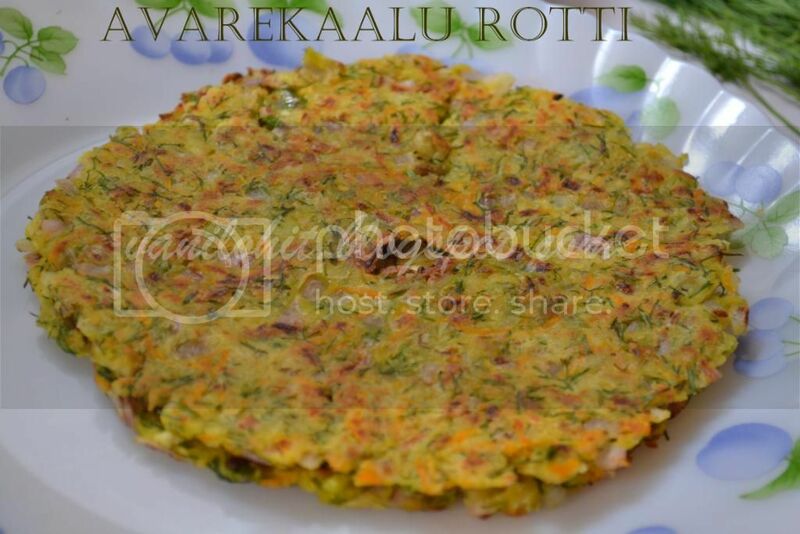 Serve this delicious rotti with your favorite side dish. Without any side dish also, this rotti tastes very good. 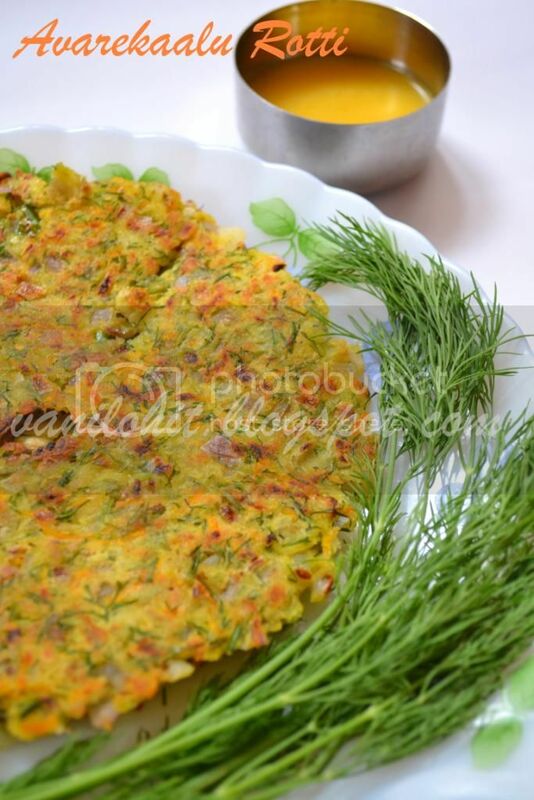 I have used dill leaves for this rotti. Fenugreek (Methi) leaves will also suit very well for this recipe. 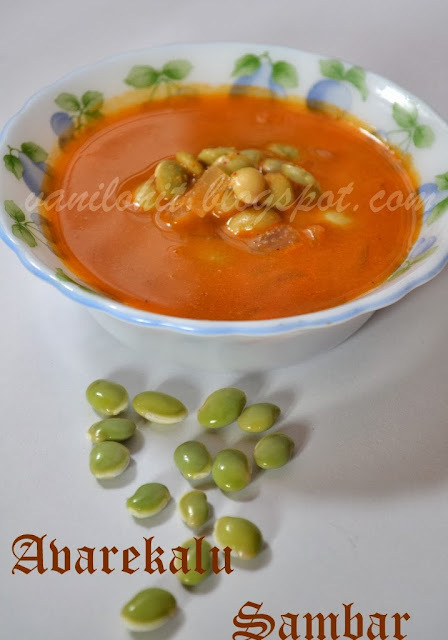 Here is one more authentic Malnad recipe from my native. 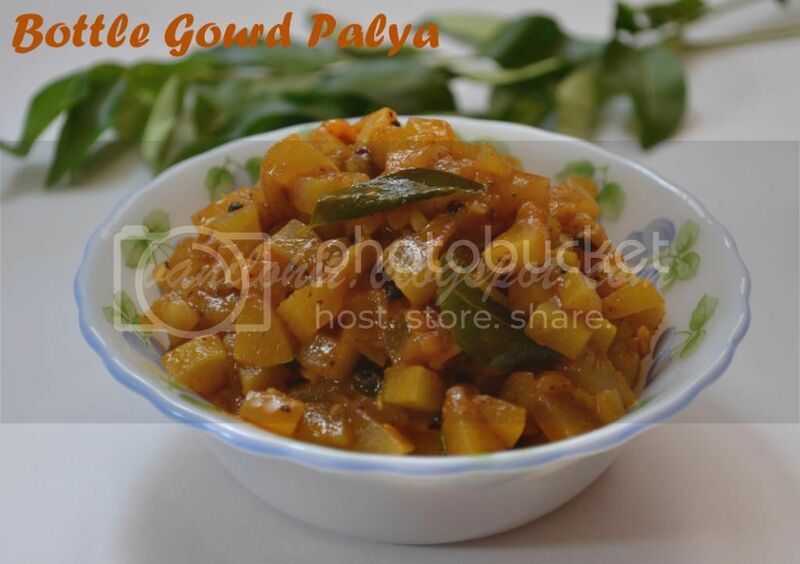 Chakke Paladya is a kind of curry which is prepared using fully grown raw jack fruit flesh. 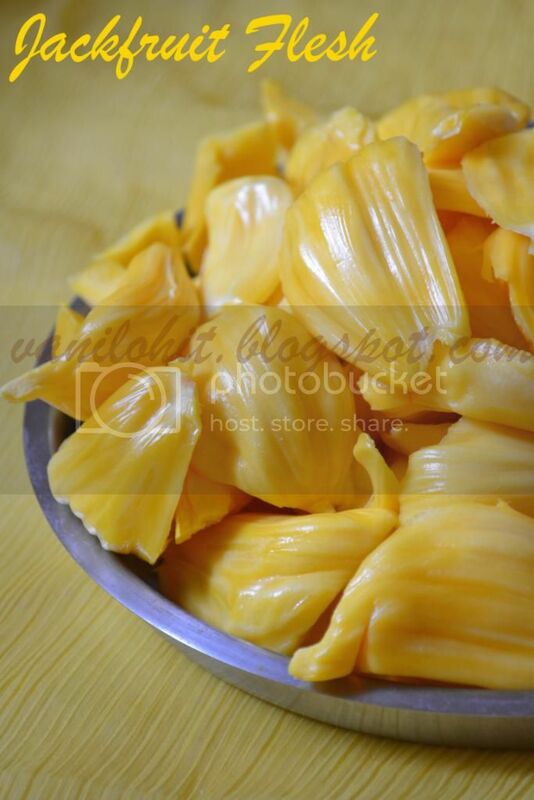 Since the raw jack fruit is the main ingredient, its prepared mostly during jack fruit season. 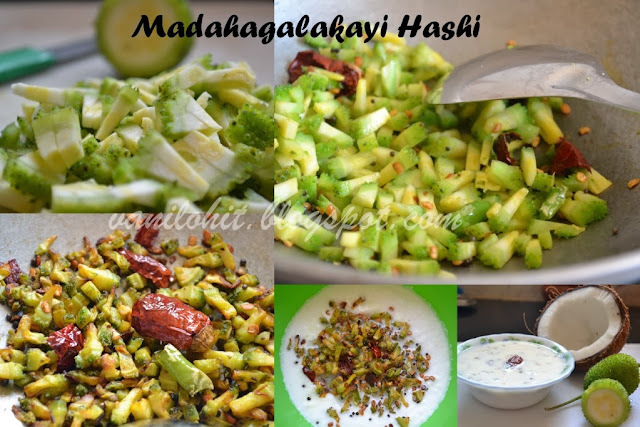 I am sharing an easy and tasty curry using raw jack fruit flesh today. 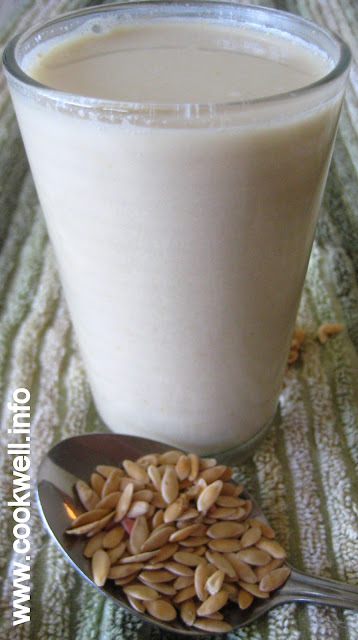 Don't forget to try this Chakke Paladya when you get raw jackfruit! Remove the seeds from the raw jack fruit flesh and chop it into medium size pieces lengthwise. In a pressure cooker, add 2 1/2 cups of water, salt and lime juice for taste, 3 - 4 drops of oil and allow to heat. To this, add sliced green chillies and chopped raw jack fruit flesh. Cook it upto 3 whistles and allow to cool. Once it is cool, take half (or little less) portion of cooked jack fruit flesh and make it into a fine paste by adding water. Add this paste to the cooked mixture and allow to boil for 3 - 4 minutes. Heat oil in a small wok. Add mustard seeds, asafoetida and roast till mustard seeds splutter. Add curry leaves and saute for a while. Add this seasoning to the prepared Chakke Paladya. Serve it hot with rice! You can cook the jack fruit flesh without using the pressure cooker. But comparatively it takes more time to cook. Adding of grinded jack fruit paste will help to thicken the curry. Finally I am done with event roundup! 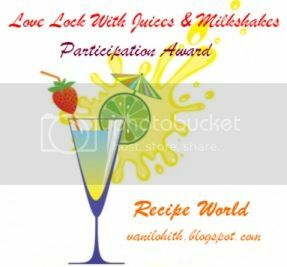 I was thinking of selecting one best recipe from the entries and publishing it here at my space. So many delicious and competitive entries, I really got confused and couldn't decide upon anything! So, ended up with giving only the Participation Award. I would like to thank all of you for these lovely and innovative entries and making the event successful. After conducting the event, I am so happy to see a nice collection of cool beverages. 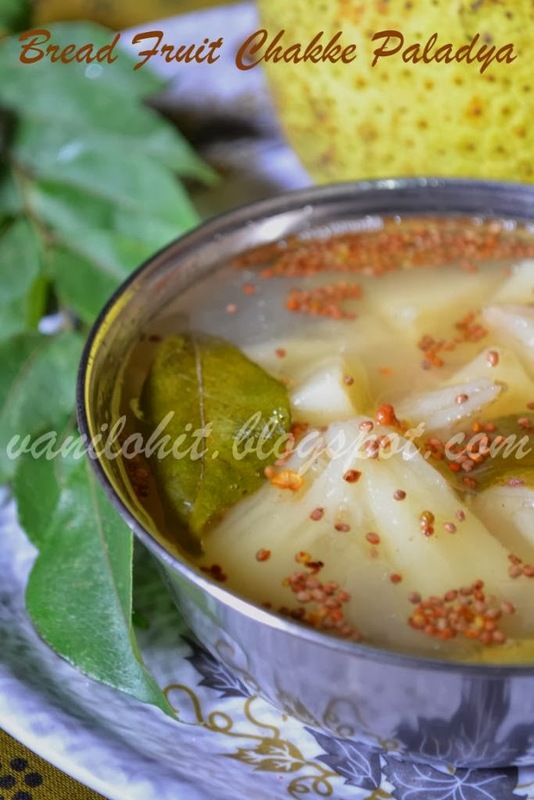 Friends, have a look at these lovely entries from my blogger friends..
Prabha @ Cookwell has sent a traditional Malnad recipe which is very healthy and perfect for the summer. Do check her recipe Yellow Cucumber Seed Juice! Bhavna @ From My Rasoi had sent 2 lovely entries for this event. and summer special Mango Banana Milkshake. 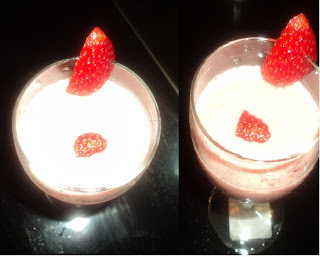 Pranjali @ Taste Bud Delight had sent an innovative recipe from her kitchen. 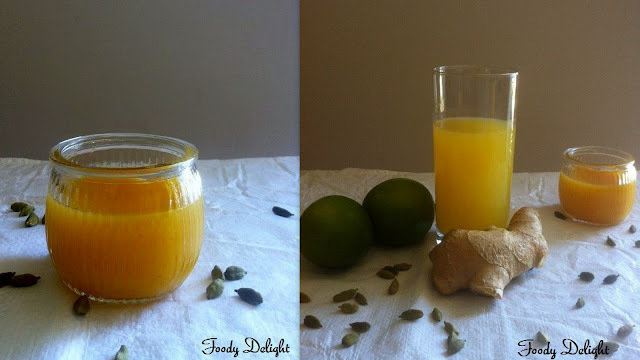 Orange Squash flavored with ginger and green cardamom. Do you believe? she had prepared this Squash concentration by herself! Sanoli @ Sanoli's Kitchen had sent a total of 5 entries to the event! 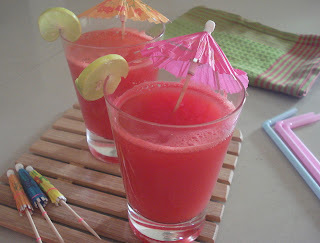 Below are the entries from Sanoli..
Watermelon Agua Fresca - a Mexican delight with Indian twist! 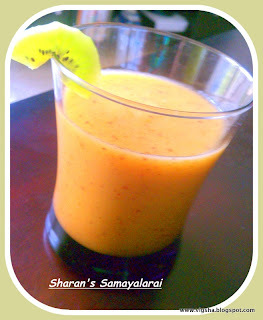 Fizzy Mango Watermelon Juice - very flavorful n healthy drink for the summer.. 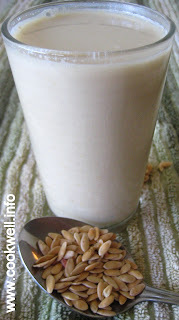 Refreshing Jeera Lemonade - refreshing drink for hot days! Banana And Mango Smoothie - yummy n creamy smoothie for summer..
Julie @ Erivum Puliyum had sent a refreshing summer drink - Cherry Lassi using fresh cherries. 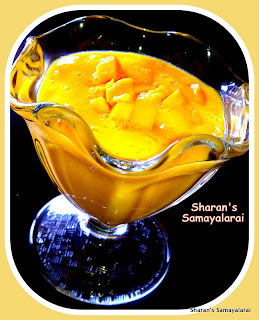 Sharanya @ Sharan's Samayalarai !! 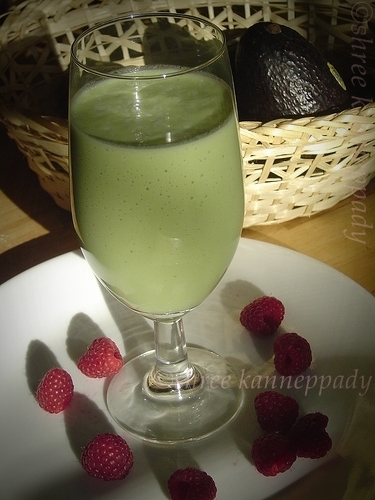 had sent below 3 delicacies from her kitchen..
Avocado Milk Shake - yummy drink with with healthy fruit! 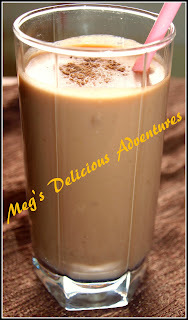 Kiwi Apple Delight - a healthy, low calory drink..
A lovely entry from Meghana @ Megh's Delicious Adventures..Chikoo Nutella Milkshake! Healthy and flavorful Mint Juice from Kavitha @ Kavi's Kitchen. 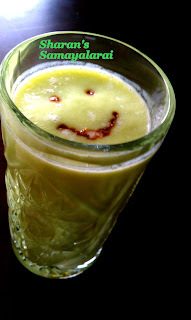 2 innovative entries from Sumedha @ Sumee's Culinary Bites..especially I loved the first one..
Spicy Tropical Green Smoothie..a healthy breakfast drink. Sparkling Watermelon Juice..looks really wonderful! Yummy Mango Shake - a lovely entry from Shabna @ Shabbu's Tasty Kitchen. 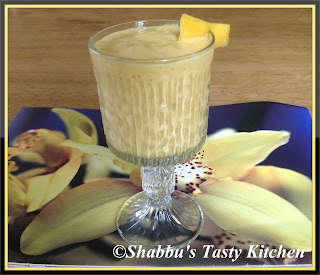 2 lovely Smoothie recipes from Shree @ Just Cooking N Baking.. Healthy and yummy Avocado Smoothie..
Mixed Fruit Smoothie..sounds delicious with well blended fruits! Next comes Priyanka's delicacies..3 lovely entries from Priyanka @ Priyanka's Simple & Delicious recipes. 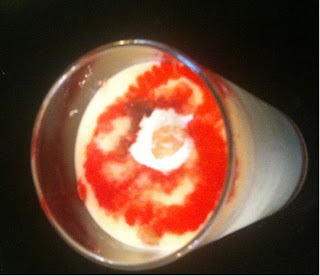 Strawberry Peach Smoothie..a lovely twist with berry and peach. 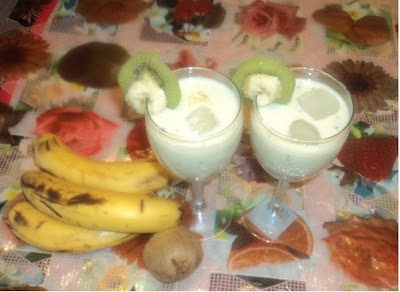 Delicious Kiwi & Banana Shake..
Mango Roohafza Ice Cream Shake..yummy kids delight! 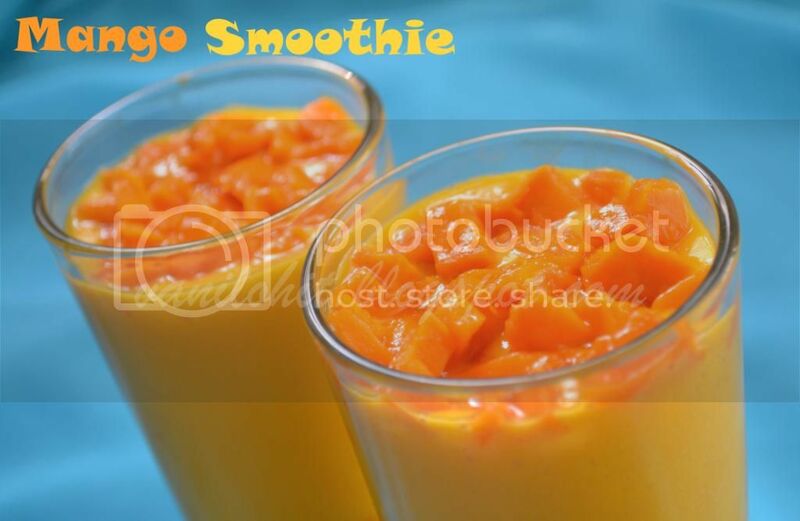 Finally, here comes my entry - Mango Smoothie!